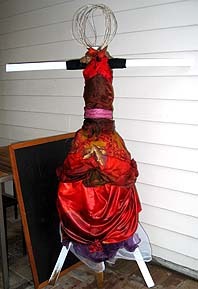 This scarecrow has a colourful costume featuring a cherry red formal gown, necklaces and a tiara. 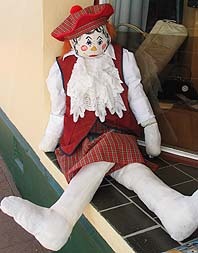 The legs and arms are straw filled stockings. This creative work scarecrow idea features a beautifully ruffled formal gown costume. The head is effectively suggested by some simple coils of wire. This attractive scarecrow has an elaborate tartan costume. The face is a creatively hand painted design. 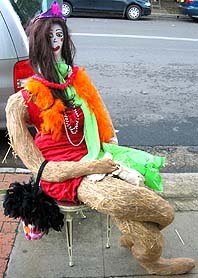 This is Nellie Strawy from the Bicycle Built for Two scarecrow display. Nellie's costume features a long formal gown, feather boa and huge dress had covered with flowers. Note: This page includes dress up scarecrow ideas for you and your kids for a fancy dress scarecrow theme: dressed up scare crows in formal evening gowns, and a scarecrow in a traditional cultural costume.